After some serious brainstorming, Folsom ski designers trickled down some design features from its custom packages to make the Completo Ski one of the most well-rounded all-mountain beasts in its class. 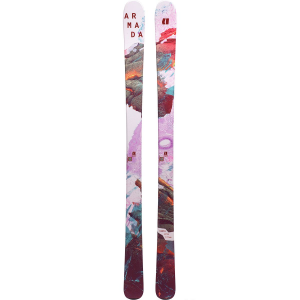 This mid-fat ski can be ridden hard on deep days, stuffed into tight technical chutes, and blasted across corduroy without batting an eyelash, making it the only set of sticks you'll need this winter. The Completo packs tip and tail rocker for float in the deep and maneuverability in tight spots, tip and tail taper to keep you from hanging up in choppy conditions, and good old traditional camber underfoot to supply all the edge grip you'll need to blast down groomers and rally through chop. To keep the Completo tough, quick, and nimble, Folsom built it on a poplar and bamboo core, which provides a killer combination of stiffness, energy, and lightness. Add a carbon-fiber laminate to the mix and you have a ski that can charge as easily as it cruises, with a tough-but-lightweight sandwich construction and UHMW sidewalls that direct plenty of power down into the edges. Finish it off with a speedy Durasurf sintered base, and you've got a ski that'll hammer whatever you point it at and then beg for more.